Air Pump Bin Lorry: cleanliness can be this easy! Rubbish collection with a big truck is always fun to watch - children can recreate this experience at home with the Air Pump Garbage Truck from Dickie Toys. Modelled on MAN vehicles, the green truck is a carefully detailed scale model of a bin lorry. Rubbish can be emptied out of the toy dustbin into the container, which can be raised and lowered by a pneumatic pump system when the young bin men press the knob or operate the lever. This patented technology means that the bin lorry from Dickie Toys doesn't need any batteries, making it very - how's that for clever waste recycling?! Air Pump Bin Lorry: cleanliness can be this easy! Come to us for toys forcreative children with an innovative design and lots of details. Rubbishcollection with a big truck is always fun to watch. Children can recreate thisexperience at home with the Air Pump Garbage Truck from Dickie Toys. 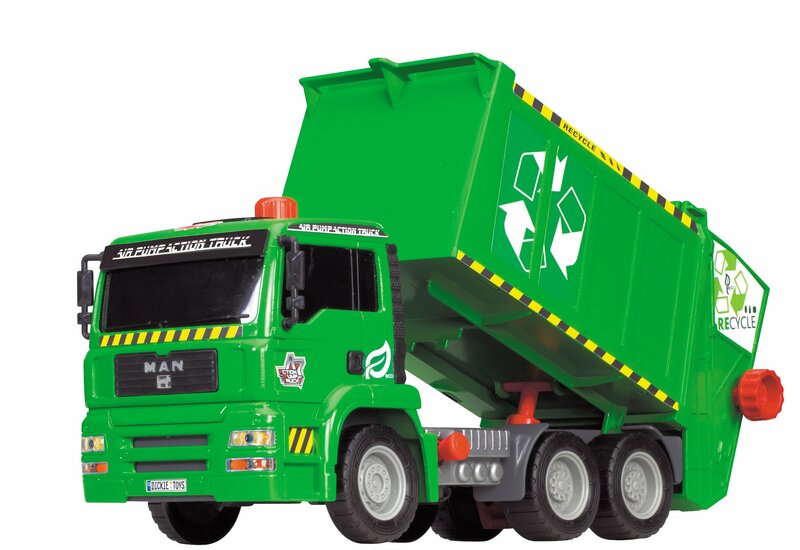 Modelledon MAN vehicles, the green truck is a carefully detailed scale model of a binlorry. Rubbish can be emptied out of the toy dustbin into the container, whichcan be raised and lowered by a pneumatic pump system when the young bin menpress the knob or operate the lever. This patented technology means that thebin lorry from Dickie Toys doesn't need any batteries, how's that for cleverwaste recycling?! Teach your children behaviour through play!